The S&P 500 index was up every month, the last time that happened was 1959. Volatility of the S&P 500 was the lowest it has been since 1964 as measured by average daily price change. The DOW hit market highs 70 times. 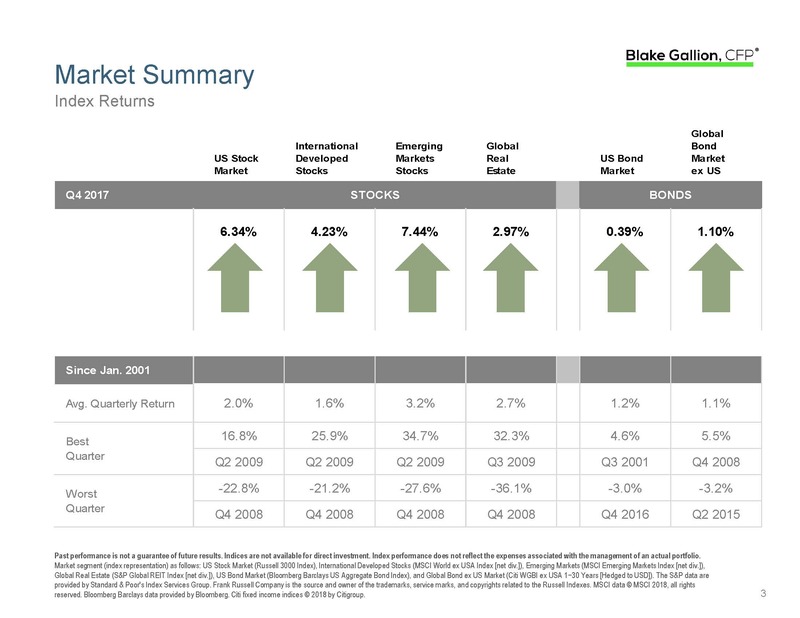 In Q4 2017 stocks in the US, international markets, emerging markets and real estate were all up. US and global bonds were also positive. The same is true for the entire year of 2017. It is worth noting that international and emerging stock markets both outperformed the US in 2017 for the first time in years. For a detailed market overview covering Q4 and all of 2017, click here. Planning note: You and I have no control of market returns, however, we do have control of how we choose to invest. First and foremost, assign a purpose to your assets. This will allow you to determine an appropriate investment strategy for your specific objectives.